Bring your Tigers football, basketball and recruiting questions, and talk to Mizzou beat writer Dave Matter in a live chat starting at 11 a.m. Friday (March 22). Matter's chat will return to Thursday next week (March 28). Greetings, chatters. Happy Friday. Happy March Madness. Happy Mizzou Chat Day. We're up and running for the next few hours to talk all things Mizzou or whatever comes to mind. Let's do this now. I was wondering, Sophie Cunningham is amazing and a legend , but if Mizzou doesn’t make it out of the second round this year, how would that affect her legacy? It's a fair question. She's raised the standard at Mizzou. This team accepts nothing less than making the NCAA Tournament because of where Pingeton and Cunningham have guided this program. But has MU hit its ceiling? Winning Friday AND Sunday would take Mizzou to the next level. Anything short of that and it's fair to say she both (A) lifted the program to a new place it hasn't consistently been since the 1980s and (B) come short of lifting the program to that next national stage, the Sweet 16. Whatever happens in Iowa City, she's already left her legacy as the one of the greatest players in team history, if not THE greatest, but taking the program deeper into the Tournament would add to her credentials and silence any criticism that MU didn't reach its potential with her on the floor. What is like as a beat writer covering the NCAA Men's tournament versus the SEC tournament or regular season? Do you feel a different buzz in the air? Sense more tension among the teams? The NCAA tourney is always a bigger event, more buzz, more electricity in the air, especially if you're talking about the opening rounds of the SEC tourney. Now, the SEC championship game can have a wild atmosphere depending on which teams are in the game and how many fans they bring to the arena. But the stakes are always higher in an NCAA tourney setting. More drama. More emotion. More tension. More everything. I've only covered a few NCAA tourney games involving Mizzou. In the bulk of my years at the Columbia Tribune I covered football only, though I was at the first two rounds in Albuquerque in 2002, when MU as the No. 12 seed upset Miami and Ohio State. I covered the NCAA games in St. Louis in 2014 and 2016. Great event always, no matter the teams involved. I presume this is about Kelly Bryant? I'm impressed with the way he carries himself around new teammates, new coaches. He seems to be striking the right balance between newcomer and established leader. He knows he's the new guy, so he doesn't have an overbearing presence. He also understands he plays the most important position on the field and has to provide leadership. If you didn't know better you'd think he's been on this team for years just how he naturally interacts with coaches and teammates. As for his talents, his arm is strong enough, probably not as accurate or aesthetic on the deep ball as Drew Lock - very few are in college or the NFL - but he's got enough arm to move the chains. His running threat will change Mizzou's offense. He can get out of trouble with his feet and create big plays on designed runs or run-pass options. This week there was a series of articles about the SEC and Mizzou? What is your bottom line ? Was it a successful move? Is Mizzou apart of the SEC family when it comes to being apart of the culture? Or is it still seen as a distant relative that doesn’t really belong? That's a big question. Missouri is still finding its way in the SEC. The financial challenges are real. Mizzou has to spend more to compete in this league. More for salaries, more for travel, more for facilities. At the same time, Mizzou is drawing smaller crowds for football, which isn't necessarily a result of the SEC move, but it complicates MU's fitness for the league. When MU made the move to the SEC, Mizzou supporters weren't prepared to realize how small the school's donor base is compared to peers in the SEC - and maybe weren't prepared to realize how monumental of a factor that would be when it comes to raising the amounts of money you need to survive and thrive in this league. I still contend Missouri made the right decision at the time in 2011, because at the time there was no reasonable expectation that the Big 12 was going to survive with three members already leaving and Texas and Oklahoma threatening to do the same. As for the cultural aspect, I think that is overblown to some degree. The difference between Columbia and most of the other SEC college towns is their unquestioned devotion to college football. The support in the state of Missouri isn't nearly as strong. Surely some of that is related to the sports markets in the state, the more pro-oriented markets in St. Louis and Kansas City. Student support, student costs play a role, too. And we can't ignore what happened in 2015. I think it's fair to diagnose Mizzou's fitness for the SEC every five years or so. The administration is making strides. A lot will ultimately fall on the ability to grow the donor base and the donor base's willingness to support the program. What do coaches have to say about Nathan? Why is he first string? I've tried to make this point a few times, but he's not really a first-teamer. The base defense is a 4-2-5 with just two linebackers on the field. If they go with a different package that uses three pure linebackers, then he'll see the field some. But when the base defense is on the field, he's not part of the mix at all. Garrett and Bolton are your linebackers. Bledsoe and Gillespie are the two traditional deep safeties (free, boundary) and the third spot where an outside linebacker would play in a 4-3 is now a strong safety. That job is a competition between Perkins and Oliver. I heard Alabama will pay its FB assistants $7 million dollars this years. How many assistants does a division 1 program have? I’m guessing ALabama leads all schools in assistants pay? Where does Mizzou rank in pay to assistants? I wrote about this a lot earlier this week. The highest paid SEC staff last year was Texas A&M at just below $6.8 million for the 10 assistant coaches. Mizzou ranked No. 20 last year at $4.38 million. This year's Mizzou staff will make $4.73 million. Alabama just paid its new staffers a lot and could go over that $7 million milestone. stltoday.comSeven of Odom's returning coaches get new deals, including new three-year contracts, plus raises, for both coordinators Derek Dooley and Ryan Walters. That's not to say another team can't draft the Mizzou quarterback, but those are the teams expected to be hot after a first-round quarterback. Trumaine Isabell spent 2 seasons at MU and averaged 5 pts per game while there. He tansferred and missed the NCAA tournament in CM’s first deason. He averaged 21 pts at Drexel and 14 at SLU this season but the last month or so is one of the forces that drove SLU to the big dance. He was the A10 tournament MVP so his missed opportunity at MU is replaced by his first and maybe only appearance in the NCAA tournament tonight. Too bad he didn’t stick around Mizzou but he has turned into a pleasant surprise for the Billikens. Yes, he has. He did not get along with the staff at Missouri. That was never a secret. Benched and suspended multiple times. Let's just say he didn't have a lot of interest in practice. The coaches didn't like his attitude or work ethic. I always enjoyed talking to him but he was rarely made available for interviews. Sharp guy. Had some obvious talent. But he butted heads with people too much to earn a regular role on the team in his two years at Missouri. Why wasn't Rountree recruited more heavily? injury history? "40" time? Good question. He wasn't seen as being very fast. That's not necessarily his strength even now, but he makes up for it with his vision, his quickness and his power. I think he's an outstanding SEC running back. It wouldn't surprise me if he runs for about 1,400 yards this year, even in just 12 games. An injury is about all that will slow him down. First-team All-SEC pick on my ballot, for sure. I think he was dealt a bad hand in a lot of ways but has made the most of his opportunity to get Mizzou trending in the right direction. He did a nice job resurrecting Pinkel's plan for the south end zone complex, then raising enough money privately to convinced the curators to provide the rest. Considering where the economic climate both the department and the university have faced, that's not a small accomplishment. The South Carolina WBB fiasco was his worst moment, by far. Otherwise, I think he's been a positive leader for Mizzou. What was wrong about his comment about Porter Jr? He said this time last year that he was blindsided by the severity of the injury. That was accurate, and I give him credit for his candor. So is Mizzou banned right now or after the appeals will they be reinstated until the NCAA appeals committee makes their decision or how does it work? Any penalty that Mizzou is appealing (postseason bans, recruiting restrictions, etc.) doesn't go into effect until the appeals committee has made its final ruling. So, as of now the baseball and softball teams are eligible to play in their respective postseasons if they qualify. Until the appeals committee makes its ruling, nothing that MU is appealing will be enforced. He's working with the second and third teams. I don't expect him to start. Jordan Elliott is a starting D-tackle and an All-SEC candidate. Depending on how the other ends develop, Byers is a guy who can shift inside and start at tackle. It might just depend on matchups and down and distance for where he plays from one snap to the next. Just based on what I've seen in practice, it appears Kobie Whiteside and Markel Utsey have a better chance at playing time than Thompson at this point. He didn't have the easiest transition to the program last year. He'll be in the mix for a backup role, and if there should be some injuries in line for more snaps. What kind of expectations should we have for Kelly Bryant in the upcoming season? I’m guessing he’s a better runner than Lock, but Lock would be a much better passer? Looking forward to the 2019 with Kelly at QB. Bryant was a more accurate passer at Clemson (66 percent) than Lock was for his career (57) or for any individual season (63 in 2018). Now, Bryant didn't throw for nearly as many yards in his full season as a starter or for as many yards per game throughout his career - or as many touchdowns. But it's fair to say he's more than competent as a passer. He'll be able to move the chains with the weapons he'll have around him. He never had a tight end like Okwuegbunam. Mizzou has talent at receiver. Knox, Nance and Johnson will be a solid starting unit. Bryant will have an All-SEC running back alongside him in the backfield. The QB running threat is what will add a new dimension to this offense. It's hard to predict what kind of impact that will have from week to week. On one hand, defensive backs won't be as worried about getting beat deep as they were the last three years. On the other hand, they'll need to account for Bryant in the run game on every snap. Defensive coordinators hate having to prepare for a mobile guy back there. It impacts your pass rush. It impacts your coverage. I'm really intrigued. 1. Vandy's season ended last Wednesday. These days, when you fire a coach it's usually made quickly. Reports surfaced that A&M was firing Billy Kennedy days before it became official. A day after Alabama's season ended in the NIT there were reports that he was negotiating his way out of Tuscaloosa. Down in Nashville last week at the SEC tourney, there wasn't any buzz about Drew being in trouble. No reports in the last week that he'd be fired. A week is an eternity with these stories. So, once a week passed, it was safe to assume he was safe for another year. Hence, my choice of the word "surprising" when Vandy fired him this morning. 2. This isn't really the Vandy way. The school has shown more patience with bad results in years past. Football coach Derek Mason just got an extension for going 6-7. He's 14 games under .500 and just got more years added to his contract. Historically, Vandy doesn't operate with the same cutthroat approach as its SEC peers. For years the school has balked at building a new football stadium or upgrading its current stadium. That's why I was surprised, even though Vandy went 0-19 in SEC games this year. Drew recruited well, but his best recruit was lost for the year early this season. His 2019 class is ranked No. 34, not great but better than Virginia, Michigan, Kansas State, Indiana, Purdue, Illinois and North Carolina. So, it's not like the guy can't attract talent. But at some point, you have to question whether he's equipped to lead this program back to the NCAA tourney with his own players. It's hard to go 0-19 in any league - and even harder to crawl back to mediocrity without a major change. Did you stay for the entire SECBB tournament or did you return home once the Tigers were eliminated? There was plenty to report on after MU lost. I came back the day after Missouri lost. Our readers care more about Mizzou spring football than SEC games that don't involve the Tigers. I heard Mike Alden was hired as a consultant to Cleveland state, is he still a member of the faculty at Mizzou? or involved with Mizzou in any way? He's officially listed as a retiree at Mizzou. I'm not certain he's still teaching. As of last summer he was still taking MU student groups to Vietnam where he's spent a lot of time the last few years on MU's behalf. As of Feb. 1 he's running Cleveland State's athletics department as interim AD. He's also done consulting work at Louisiana-Lafayette and UMKC. Dave, I know football drove the move to the SEC. But I think some of the enthusiasm has dropped because we haven't done well in SEC basketball. I think back to the 2011-2012 school year (I was a student at Mizzou then) and the buzz on campus was "Alright we are gonna dominate SEC basketball outside of Kentucky and maybe Florida we should beat up on everybody". Obviously that hasn't happened. Largely due to KA and Frank Haith did not produce. Haith really underachieved in the SEC. First year in the conference he had Pressey, Oriakhi, Ross, Bell, Brown and they had an underwhelming season. 2013-2014 he still had Clarkson, Brown not as much talent but still bad season. Part of the lack of success can be attributed to the league just getting a lot better all around. But back to my main point. I think if Mizzou was excelling in basketball Mizzou would feel and be viewed differently. This is just my opinion but I feel like a lot of people expected football to compete for SEC titles as they have done in some years but they also expected Mizzou to be a force in basketball. Yes, there's truth to that. But from a league-wide perspective, this is a football conference. Schools have made basketball more of a priority, but it's still very much a distant No. 2 to football at every program except Kentucky. I share this all the time, but it's worth repeating: Whenever I cover a Mizzou road basketball game in the SEC, local reporters are shocked that media outlets travel to cover road games, with the exception of places like Arkansas and Kentucky. Arkansas because it's relatively close to Columbia, and Kentucky, because everyone travels to Rupp to cover games there. Basketball just isn't THE priority at 13 of the schools, so even if Missouri was consistently playing in the NCAA Tournament and winning 20 games, the school's athletics program would still be measured through the football perspective in this conference. Hi Dave - I have been away from your weekly chat for several weeks - so I'm glad to be back. Excuse me if I ask questions that you may have answered. We have been fortunate the Larry Roundtree has not been down with injuries. However, if it does happen, do you think Tyler Badie can carry a large portion of the carries? Thank You. Badie showed last year he can produce in the SEC, but I'm not convinced he's a 20-carry-a-game kind or running back. He's currently sitting out practices with a minor injury - and last year nursed a foot injury that cut into his carries late in the season. Other than Kelly Bryant, Rountree is probably the most indispensable player on the roster for 2019. Simi Bakare will get touches this year but outside of some late-game action at Tennessee, he's mostly untested in games. Anthony Watkins will have a chance to play a role this year, but you never know how ready a freshman will be. If everyone at the running back position is healthy, this will be a productive group. But it's not loaded with proven talent. Did we get any further information on why the Mizzou women are a #7 seed when everything prior listed them as a 5 or a 6? And any prediction for today's game? ESPN listed us in their article on upsets to watch for. Guess we have a long way to go to get any respect outside of CoMo. If you're not a top 16 seed in the women's tournament you run the risk of being at a big disadvantage with the seedings. That's the reality of the women's tournament because the NCAA knows it wouldn't attract big crowds at neutral sites for the first two rounds. Geography is essential to the seeding process in the women's tournament. Yes, Mizzou is a 7 seed but among the 16 host sites for the first two rounds, they were placed in the closest site. Missouri was not upset by that part of the equation with the seedings. Being a 7 in Iowa City is far more favorable than being a 5 or 6 in Corvallis, Oregon or Syracuse or Miami. Because of seeding rules, Missouri couldn't be a 5 in a regional with an SEC team as a 4. So that ruled out the Chicago regional, where Texas A&M is the 4, and it ruled out the Greensboro regional, where South Carolina is the 4. The brackets are a big puzzle bounded by rules, but in Missouri's case, I think getting a 7 in Iowa City is ideal. Does MP Sr still plan on remaining on the coaching staff for next season? I can't answer that. He hasn't done interviews all season. I wouldn't be surprised if he goes in another direction if/when Jontay leaves the program. I have been to a couple of Mizzou softball games this year. With all of the competition in the SEC, a new coach and what looks like a young team, it seems like it will be a challenging year. If the sanctions don't get overturned and the decision is made too late to impact this year, it seems like missing post-season this year would be a better deal than next year. But I guess you can't predict the future and you wouldn't want to single out the softball team and not appeal the ban? Well, I would have agreed with you a week ago, but the Tigers just took two out of three from No. 8 Georgia, so maybe they can surprise the league, get a mid-tier seed in the SEC tourney and make another NCAA regional. Dave I like the present staff that coach Odom has put together. He had some that didn't work out earlier. Take into account he was a head coach in training and then a dc in training and a oc in training I think they have made progress in the program and I like the direction it is in. He certainly seems to like this staff considering the contracts he just gave most of them. He's got position coaches making far more than coordinators made in the Pinkel years plus position coaches working on multiyear deals. 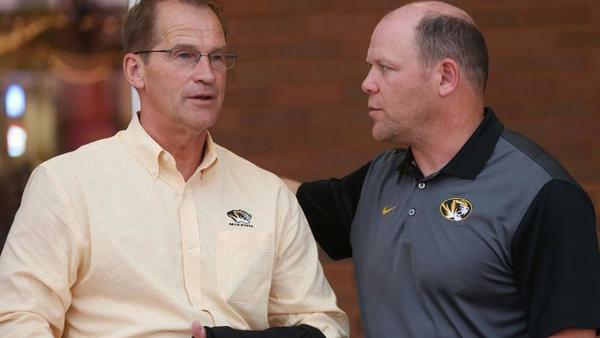 There was a time not too long ago that head coaches at Mizzou outside of football and basketball worked on one-year contracts. As for Odom's staff, Dooley proved he could run an offense last year. Can he do it without a first-round QB? Brad Davis seems like a strong hire to lead the O-line. Cornell Ford has done nothing but produce 1,000-yard rushers at running back. I think having AJ Ofodile coach the tight ends is quietly a really good move. Ofodile knows how to coach wide receivers but at a more superficial level. He KNOWS the tight end position inside and out. I think you'll see that group play better than ever under his watch. McGee has coached a lot of places. He knows offensive football. On the defensive staff, it's still fair to wonder if Walters can develop a defense that's among the top half in the SEC. But David Gibbs is a quality hire. He'll make a difference in the secondary this year. It's always been 3 pm on April 13 as far as I've been told. Dave - With Albert O taking it easy for spring practice not to aggravate his should injury, do you have any insight on how the TEs are doing in spring practice. I'm still amazed at the adjustment Daniel Parker made last year. Ofodile is really pleased with Parker's progress. I talked to him yesterday about the group and he's not shy about how good of a route runner Parker has become. He's got more upside to be an impact tight end than anyone realized when they moved him last summer. Odom has been high on the way Scales approached the offseason but he's been slowed by an injury. Same for Christopherson. Swinson is still coming back from his knee injury, but you can see his skills in flashes. He's got a chance to be a really good player. Dave - Any updates on the appeals process for the football team? Thank You. No update other than Mizzou has until Sunday to formally file its appeal. Process is still in early stages. Dave, great point football is obviously the king and basketball isn't even close. I do hope the excitement will help for years to come with the Kelly Bryant signing. Truly a great accomplishment by Odom beating out all those other SEC programs. Unfortunately I do have DISH, so I haven't had HBO since the fall. We're making our contingency plans now leading up to GOT. OK, folks. That's all for today. We'll chat again next week.